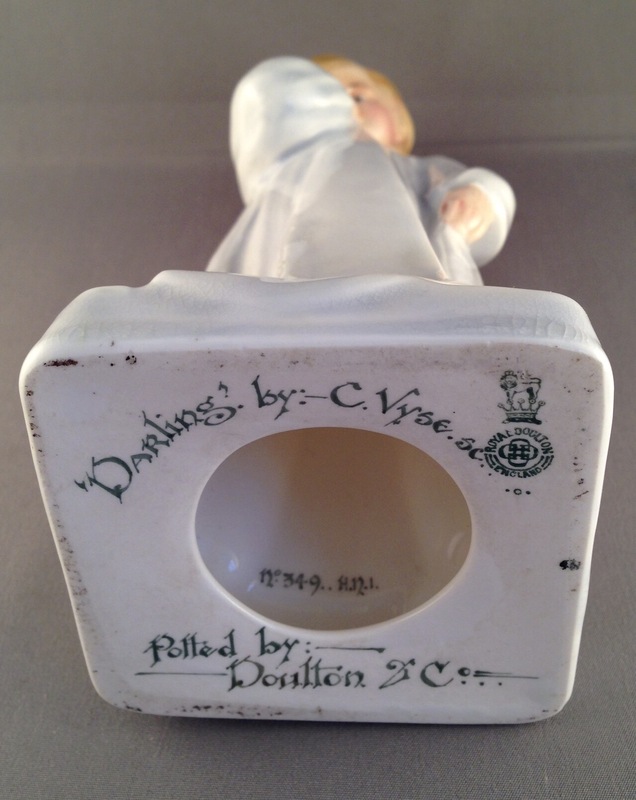 Royal Doulton’s Figure Darling – where it all began! Or rather where the then new figure range began in 1913 – is perhaps how that heading should read. Darling in his original size with HN 1 at the fore, the HN 1371 and of course the more frequently found HN 1319. In reality Darling was not the first figure in the HN collection but due to Queen Mary’s famous christening of him with her statement “Isn’t he a darling” – he was given the prestigious number 1 in the new number sequence. Typical early base, this time belonging to HN 1. Note the actual number of figures painted on the inside ‘349’! 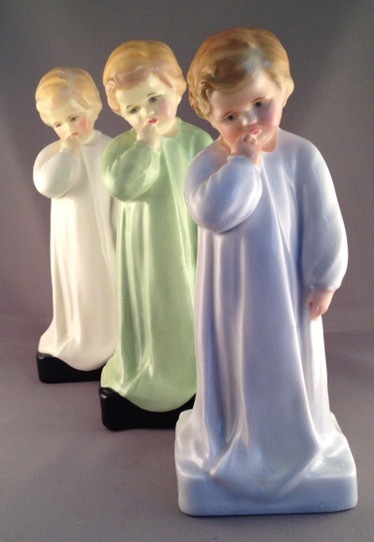 Designed by Charles Vyse who would later inspire Doulton’s famous balloon sellers, Darling was produced in his original size of 19cm in four colourways – HN 1 in a pale blue grey nightshirt, HN 1319 in a white nightshirt with black base and then HN 1371 and 1372 in green and pink nightshirts respectively and both with black bases. Of all these originally size models it is HN 1371 and 1372 which are the particularly rare examples. In the post WWII period Darling was remodelled in the now smaller and most familiar size of 13cm as HN 1945 and remained in production as such until 1997. A lovely additional version of him HN 3613 for Peter Jones the China specialist was introduced to mirror the original HN 1 colouring in 1993. Only one further model of this charming young boy has been produced and that was for Royal Doulton’s 200th Anniversary Icons series as HN 5648 in a smaller size again of 10cm! The now mid size Darling HN 3613 with his smaller Icons series counterpart HN 5648, pictured against the first figure booklet from 1913. Note the reference to Queen Mary and ‘Now at Buckingham Palace’! 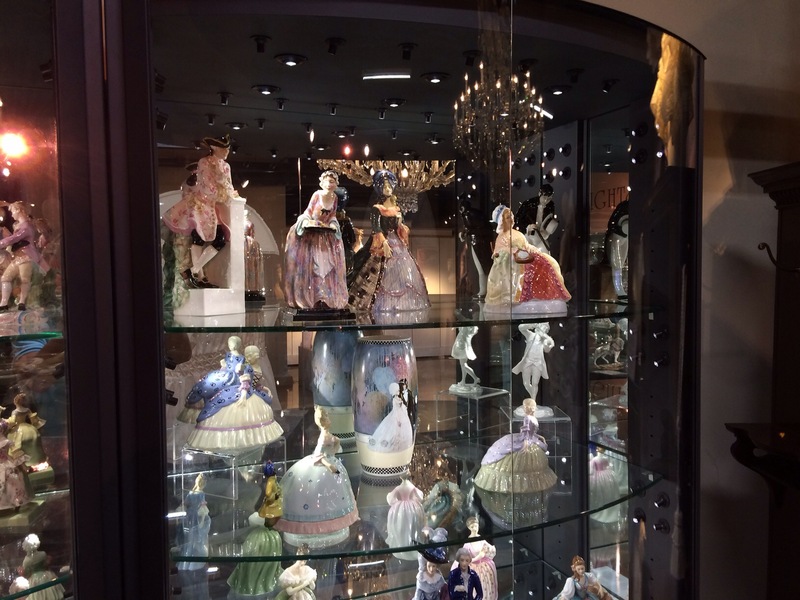 All in all Darling proved to be the first of one of Royal Doulton’s most popular collecting themes when it comes to figures – children! 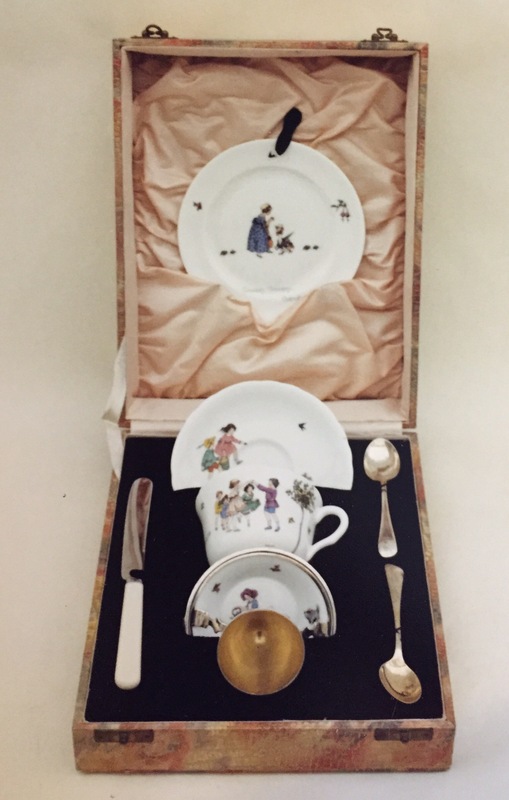 A smart child’s breakfast set, once popular christening presents. 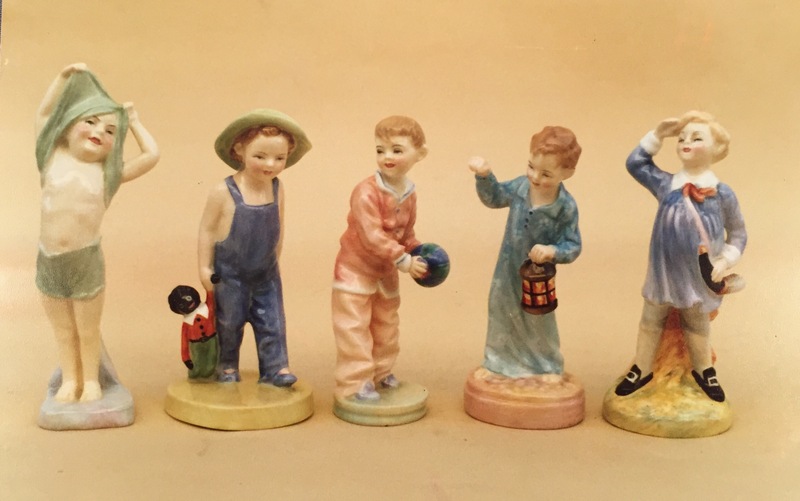 Classic nursery rhymes have long provided much inspiration for Doulton’s designers and just like many Seriesware designs the L range was influenced by another artist, Ann Anderson. Introduced in 1916 there were 12 different designs produced featuring classic characters such as Little Tommy Tucker, the Queen of Hearts and This Little Pig. A variation of the boxed set above. 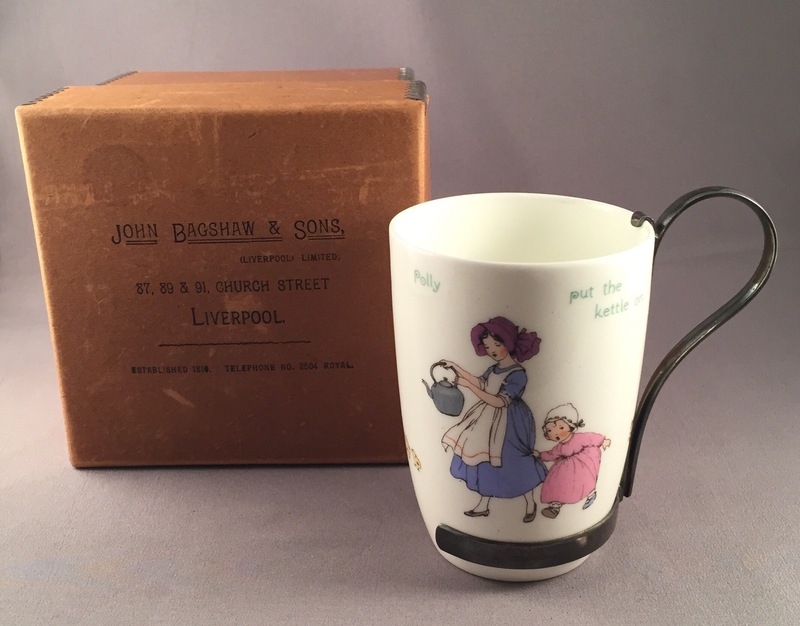 Typically produced in bone china the precise date of withdrawal is unknown, although the outbreak of WWII is given as it is with so many of Doulton’s different lines. The bases of items with these designs can carry H or D numbers for this series ware pattern. Beaker with silver plated handle and original retailer’s box. As with so many series ware designs hunting down items provides a great challenge and a collection of them makes a great display. 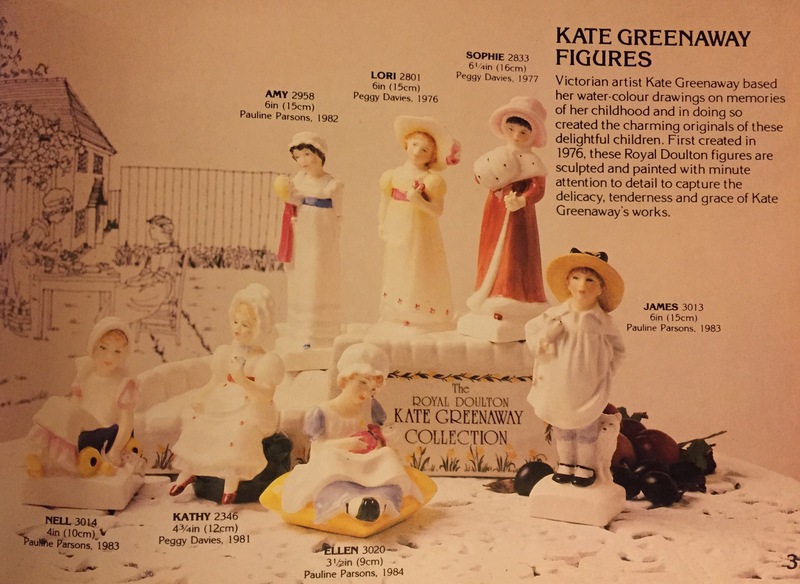 Collecting Royal Doulton’s Kate Greenaway child figures. Even today we are all aware of the work of Kate Greenaway be it as a book illustrator or artist. 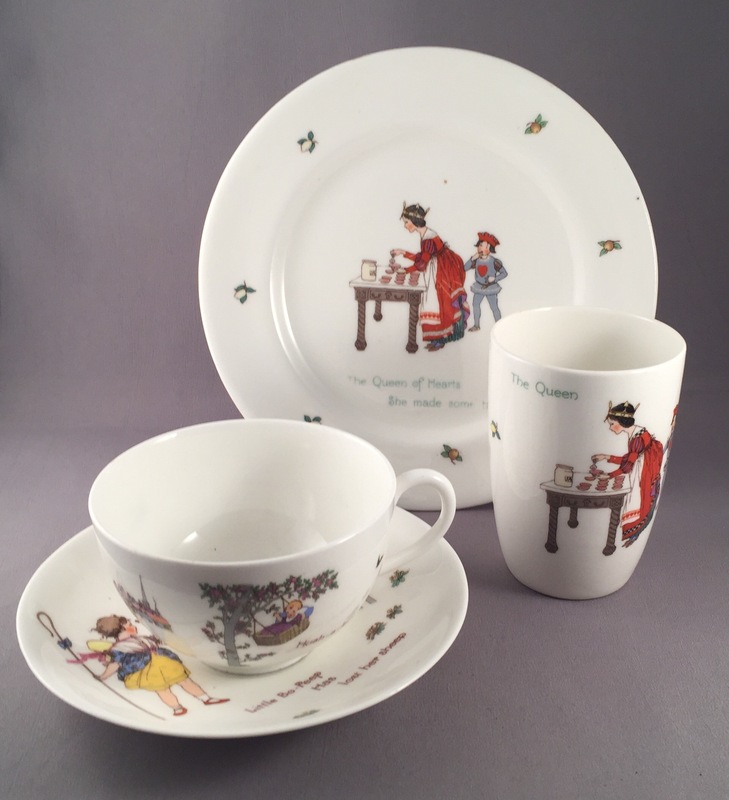 First introduced in 1976 with the figures Ruth, Carrie, Lori and Anna, and all skilfully modelled by the great Peggy Davies, the children in Royal Doulton’s Kate Greenaway Collection are based upon illustrations by Kate that she in turn based upon her own Victorian childhood and upbringing. Illustration from Doulton’s 1979 catalogue. Born in 1846, Kate first came to the public’s attention with her illustrations for Christmas cards. Then following a series of successful water colour exhibitions, she wrote and illustrated her Under the Window children’s book. The legendary Peggy Davies at work. 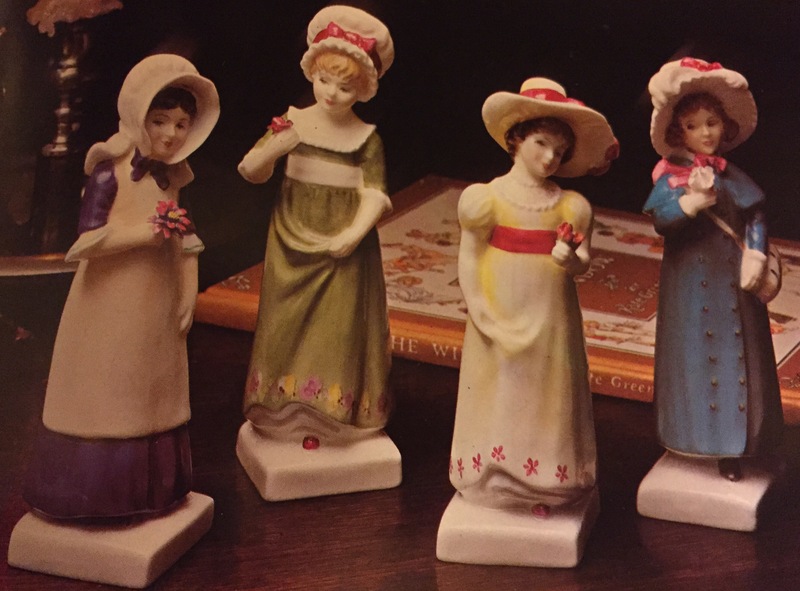 The 18 children created by Doulton express the popularity she gave to bonnets, mop caps and high waisted children’s dresses with which she illustrated such famous books as The Birthday Book and Little Ann. Moreover, it was said at the time that she “dressed the children of two continents.” Reflecting her worldwide appeal. Illustration from Doulton’s 1987 catalogue including the display stand. 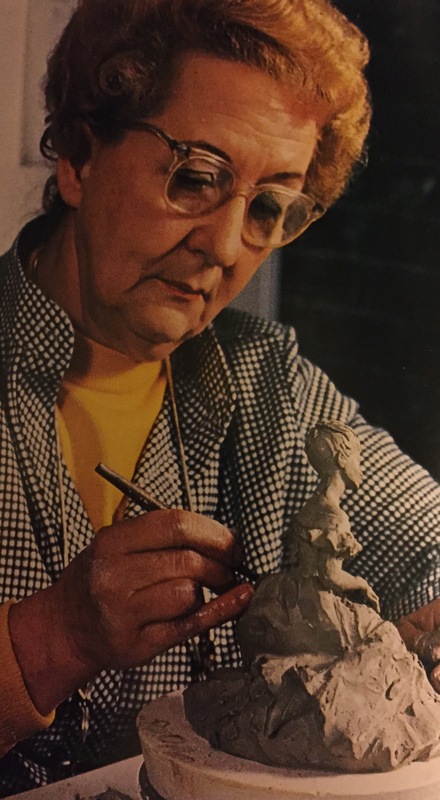 Whilst the first 13 figures were modelled by Peggy between 1976-81 with annual introductions between these dates, it would be Pauline Parsons who completed the set between 1982-4 with five more children. The series was finally withdrawn at the end of 1987, three years after the last introduction of a new figure in 1984 with Pauline’s Ellen HN 3020. Two classic Kate Greenaway figures Georgina HN 2377 and Carrie HN 2800. 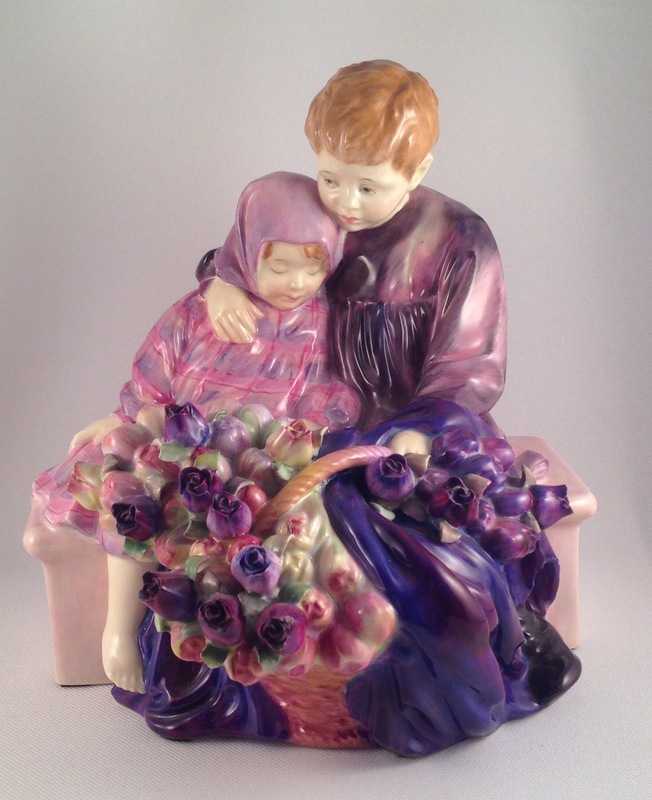 In producing these charming child studies Doulton sought to recreate in china the ‘delicacy, tenderness and grace of Kate’s work.’ This attention to detail explains their enduring popularity among collectors to this day and naturally those with shorter production runs including Tom, Ellen and James are the most keenly sought after and carry the usual price premiums. 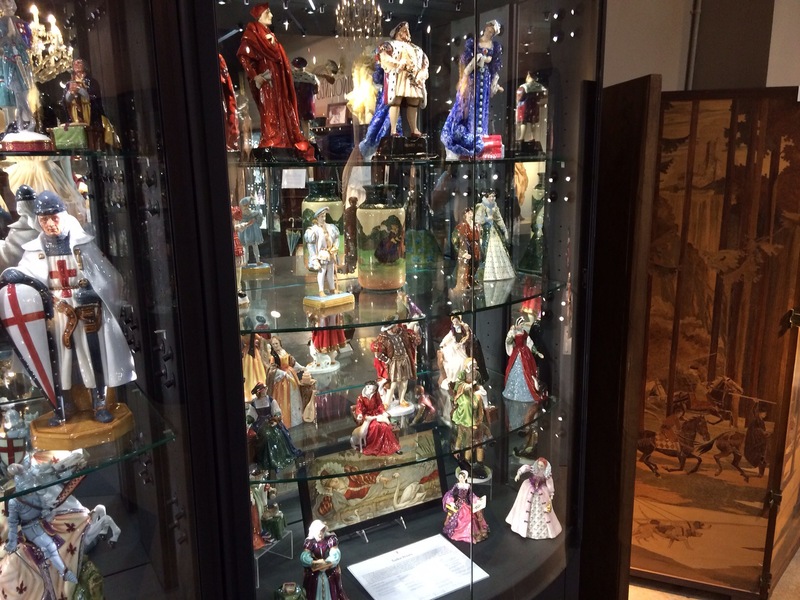 Also popular with collectors is the display stand seen in the above catalogue illustration. 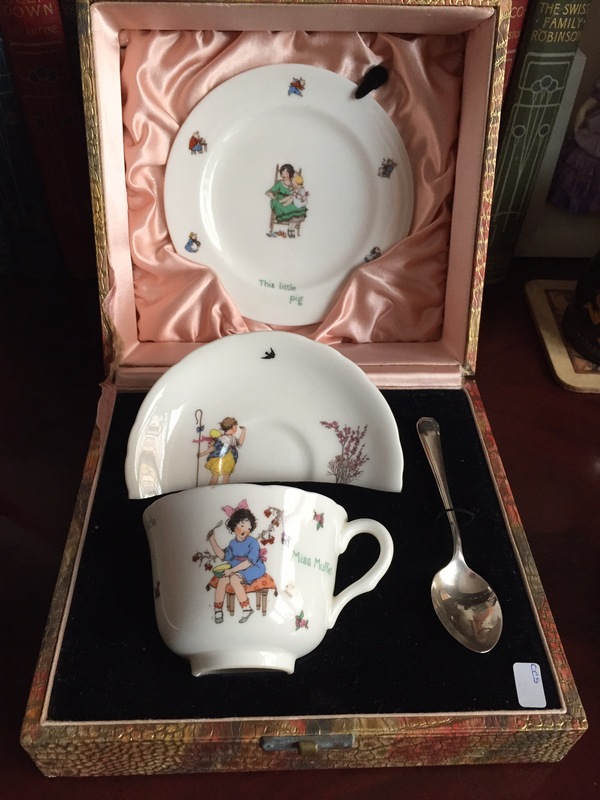 Collecting Royal Doulton child studies. 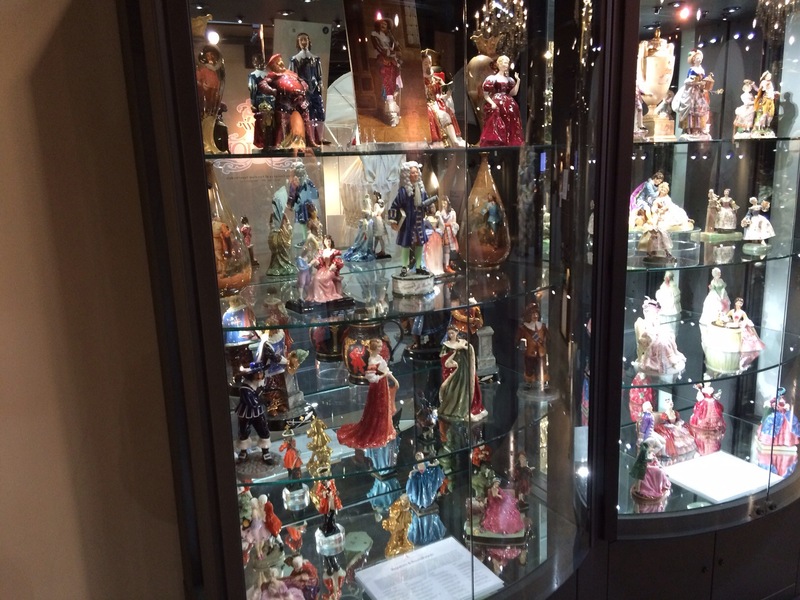 When we think of Doulton many think immediately of pretty ladies and young girls in crinolines, yet here is another collecting theme although generally much harder to track down. 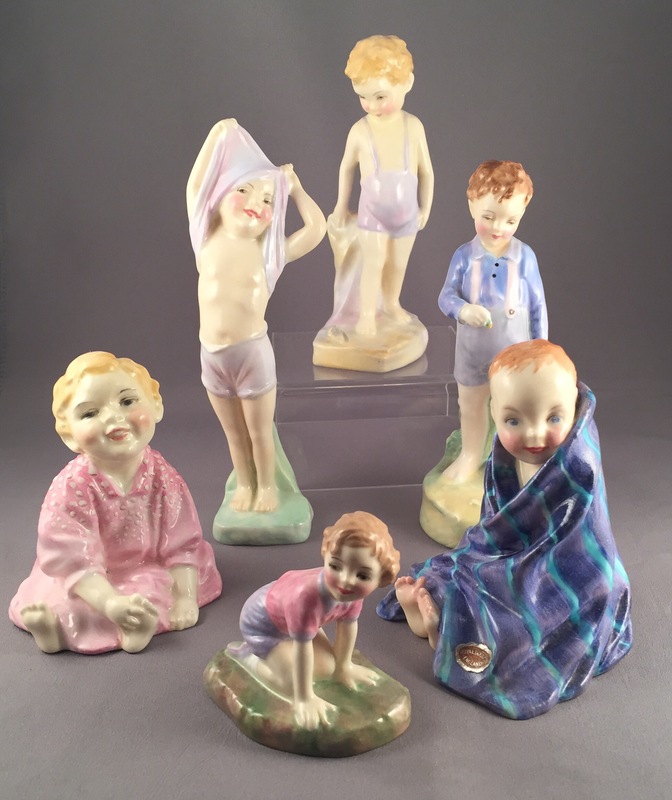 These studies of boys by Doulton were the work of Leslie Harradine and date to the late 1920’s through to the 1950’s. 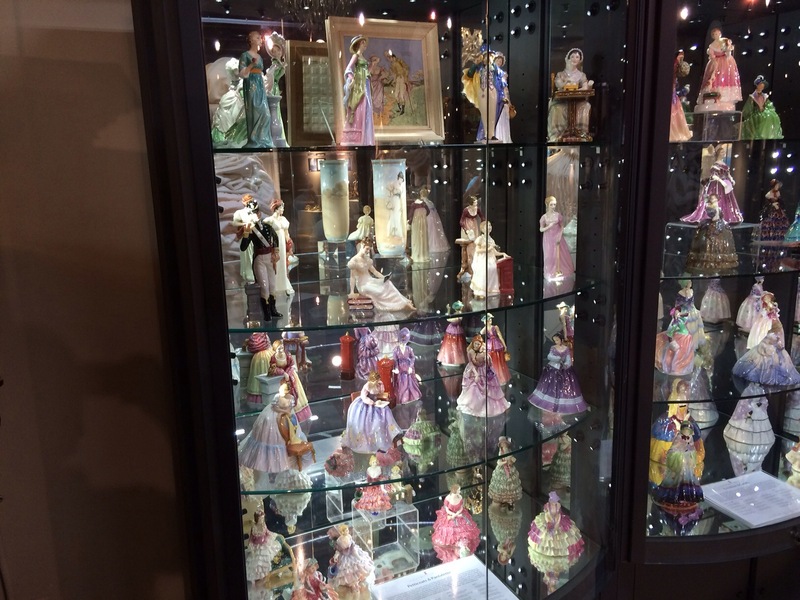 Although there are only a handful of male figures, if you have the patience to track them down they make a complimentary display to their female counterparts! 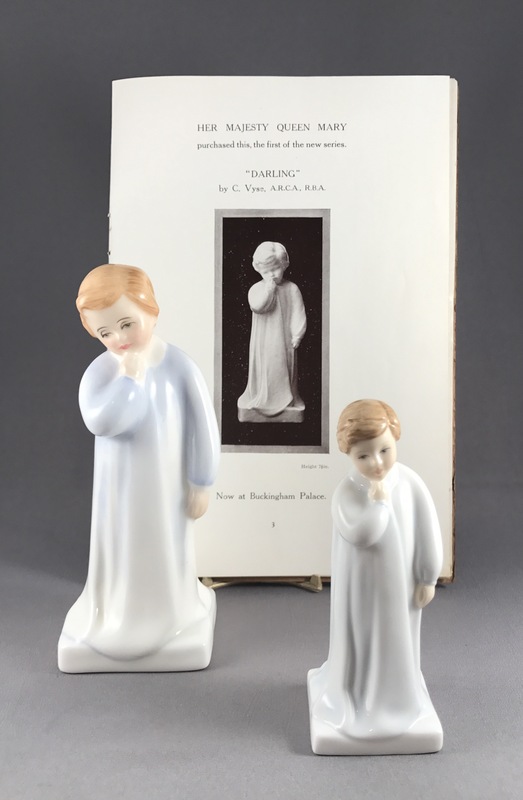 The popularity of child studies has long been a favoured collecting field for Doulton enthusiasts, once again bourne out by the enduring popularity of HN1 Darling – a Charles Vyse study of a boy in his nightgown modelled after his Chelsea original and introduced in his original size in 1913. 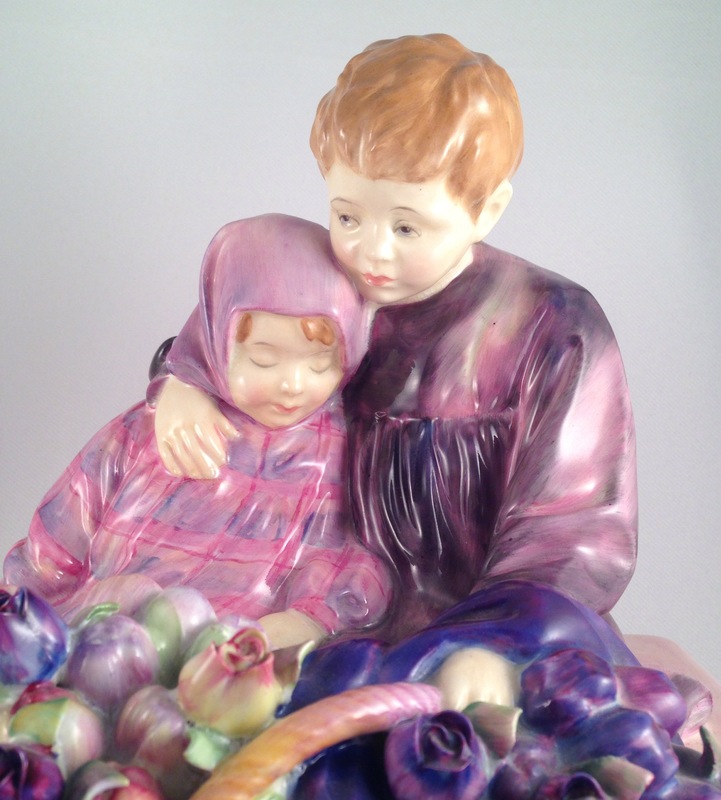 A look back at the enduringly popular Flower Seller’s Children. A close up of the skilfully painted children’s faces. This delightful study was the concept of Leslie Harradine in 1921 during his first year of supplying models to Doulton’s studios in Burslem. 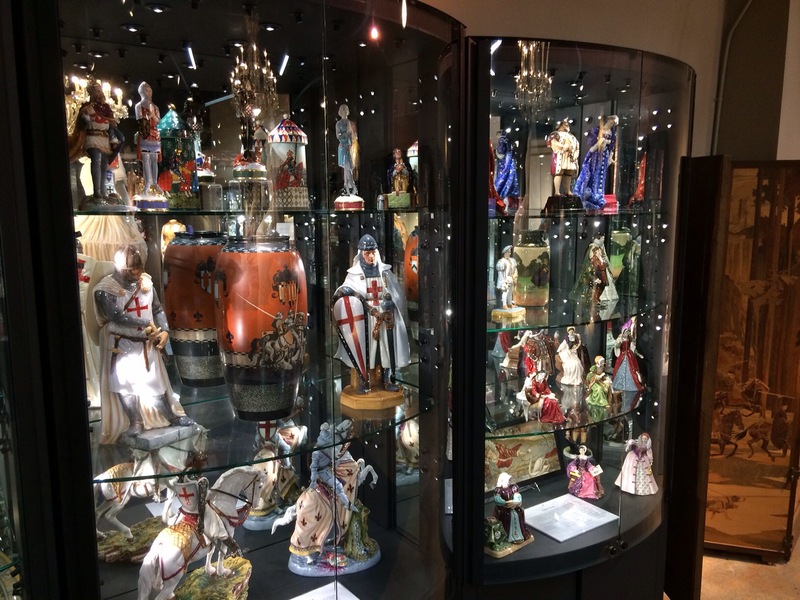 Harradine had been apprenticed to Doulton in Lambeth in the early years of the 20th Century but factory life he found unbearable and so broke loose from these confines. He continued to supply models to Lambeth’s studios until his departure for Canada. This early time in Harradine’s association with Doulton we have covered already in the three part article on his life. Upon his return Charles Noke, Burslem’s art director, tried every enticement to attract Harradine to move to the Potteries but to no avail. A compromise was of course reached whereby he would supply models to Burslem, something that continued for many decades. This early group by Harradine was available in 5 different colourways and one HN1342 was produced until 1993. Whilst not classed as a prestige piece the painting that can be found on these pieces is stunning as I am sure you will agree. Harradine’s inspiration for this piece apparently came during an evening out in London, whereupon he saw such a scene and sketched it upon his shirt sleeve. A romantic story for a sentimental group. The enduring charm of this study meant that a collectors plate and more recently a miniature version of this group HN4807 was introduced in 2005. What is in a name? 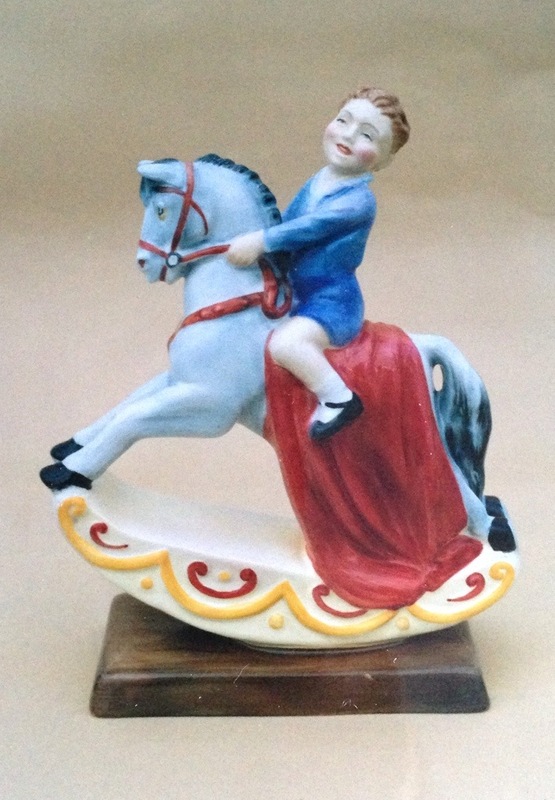 Royal Doulton’s ‘The Rocking Horse’. 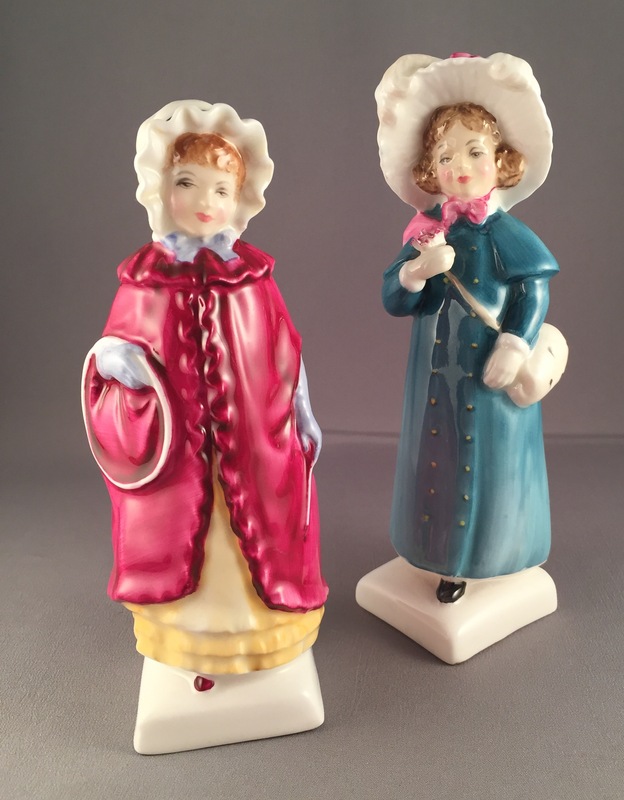 This particular figure I am sure you will agree is charming and belongs to a small group of rare Harradine figures produced for a very short period post WWII. The only reason I can see for this figure’s short production (1951-3) is that its production was too costly at a time of rationalisation within the Burslem factory. The inspiration for this figure is undoubtedly the film ‘The Rocking Horse Winner’ from 1949, where a young boy discovers he can predict race winners by rocking his rocking horse!